Talk about a popular Audi performance upgrade. This fits the bill and for good reason. If you are looking to drop your ride a couple inches with a premium entry level coilover suspension system, you have come to the right place. This produce has heavy gold zinc plated housings and progressive rate elastomer bumpstops. Solo Werks Premium Entry Level Coilover Suspension built specifically for the 09-16 A4 Quattro, 08-16 A5 Quattro, 10-16 S4, 08-16 S5 and the 13-15 RS5. Solo Werks provides a 3 year limited warranty to the original retail purchaser of any Solo Werks S1 Coilover Kit. 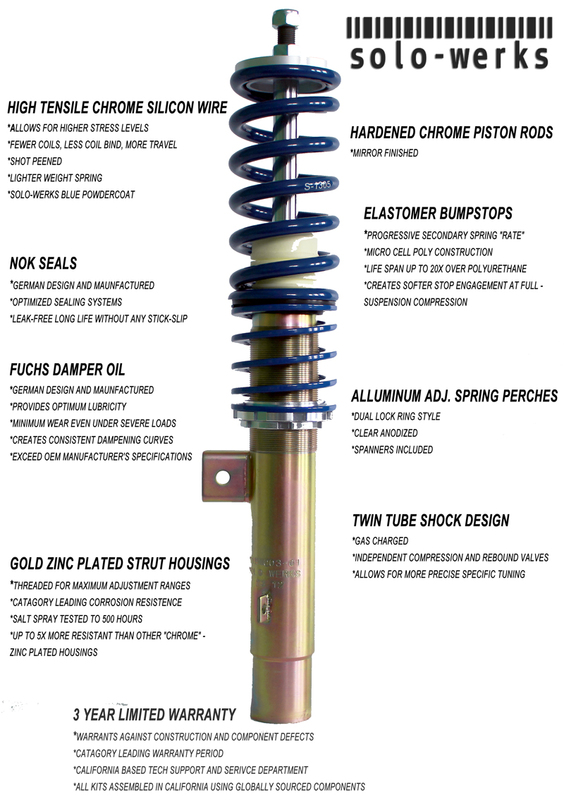 This limited warranty covers defects in materials and manufacturing of the components of the Solo Werks Coilover Systems on street driven vehicles only. Installation or labor charges for removal, reinsatallation or alignment are the responsibility of the end user, and will not be covered or reimbursed by Solo Werks or any of its authorized agents. Night and day handling in comparison to stock. Very stiff if you go really low. The handling is insane. Very sharp and noticeably fast in acceleration a sway bar is highly recommended. Overall very happy. Overall, bang for your buck. Gets the job done. I'm happy with my purchase though. The guys at Modded are super helpful and really know their stuff. I have to highly recommend this product and company.